Have you heard of her? Faryl Smith is a young English mezzo-soprano who made it to the finals on “Britain’s Got Talent” in 2008. She released two albums in 2009: “Faryl” and “Wonderland.” I love the clarity of her voice and how it carried the sweet unaffectedness of girlhood. I especially love her renditions of “Calon Lan,” and “Night of Silence” in those albums. I read these days she’s taking voice studies seriously as she prepares for university, and moving towards opera (away from classical crossover). She’s one I’d like to keep track of. …in “The Little Mermaid” was the first event that started my obsession with voice. (Hearing Emma Kirkby sing solidified it.) Jodi was my idol for years, and I still love her voice. Reading articles about her strong faith made me respect her even more. Here’s a great interview Disney put on its blog in tandem with the release of “The Little Mermaid” on Blu-ray. 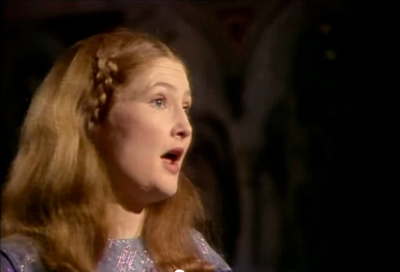 This amazing soprano (and Jodi Benson in “The Little Mermaid”) is why I started singing. I heard her incredibly pure and clear voice on the radio in college, and was mesmerized. She was singing Bach’s “Coffee Cantata,” specifically “Heute noch, lieber Vater…” I don’t think I’ve heard any singing since more beautiful. Someone kindly posted a series focusing on Emma on YouTube. I watched a bit of it, and look forward to watching it all!